FloatingLyrics: What is it? How does it work? FloatingLyrics is a floating widget which pops up as soon as you play a song from your music player of choice displaying the synced lyrics of the currently playing track. 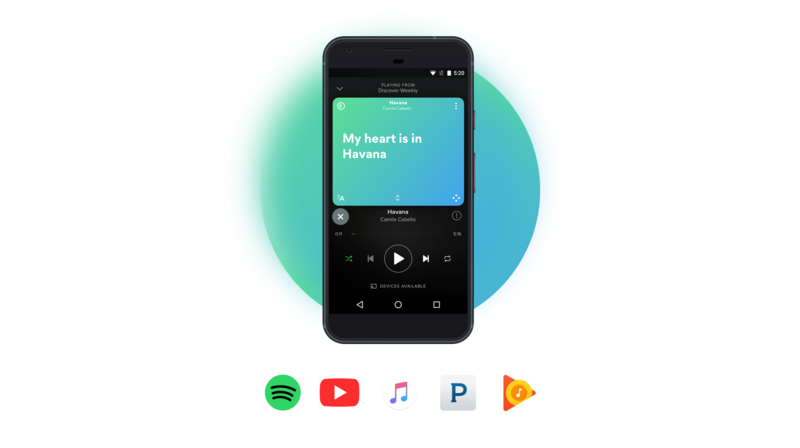 It’s compatible with the main music apps like Spotify, Youtube, Pandora, Apple Music, Soundcloud, Rdio, and Play Music so you don’t even need to switch players to bring up lyrics. You can press the pop-up window and drag it to the position you want. FloatingLyrics can be also resized by touching the bottom of the widget box where there is a small up and down arrows icon. Tapping it and dragging your finger across the screen you can reduce or increase vertically the dimensions of the window as you please. You can also quickly choose your display mode (compact or extended ) by tapping the display mode icon in the upper left-hand corner. Add some magic to the Floating Lyrics changing the theme background color in just one tap. Click the display mode icon in the upper left-hand corner and choose your favorite color between the ones available in the list. Tapping on the "X" icon once will minimize the Floating Lyrics. If you drag the chat head down off the screen, a notification giving you the option to ‘Tap to show lyrics’ will appear in your notification center. Switch from the compact (one line of lyrics at a time) to the extended (continuous stream) lyrics view by tapping the display mode icon in the upper left-hand corner and choosing your favorite lyrics visualization. Click the translations button at the bottom-left corner and pick the destination language you want to see the lyrics of the song you're listening to translated into. Tap the crowd icon to see the latest activities on the lyrics or start contributing. Are you guys ready for getting music with lyrics, give Musixmatch's FloatingLyrics a try now!